I knew I wanted to end this little collection of beers with something spectacular, so it was with considerable pleasure that I found a couple of bottles of Redchurch lurking in the back of the cupboard. 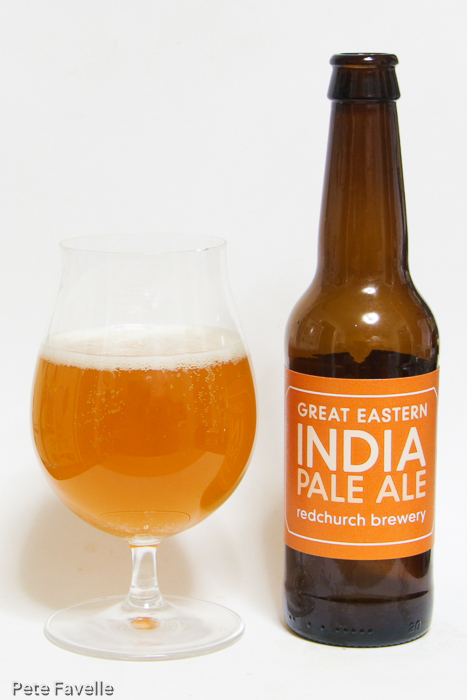 Great Eastern IPA is a magnificent beer; so much so that the last time I got around to doing a Golden Pints post, it ranked as my bottled beer of the year. The aroma is a fruit explosion that I can smell from halfway across the room. Sweet peaches, pineapple and pine resin – to quote my own ‘Tour At Home’ notes, it’s like sticking your head inside a big sack of hops. It’s just as full of hops in the mouth; an initial burst of overripe tropical fruit is swiftly overwhelmed by a huge bitter, resinous hop blast. Intensely floral, with a slightly sticky caramel undercurrent that is buried under a wonderfully lingering bitterness that builds and builds into the finish. There’s a gentle alcohol warmth, but it’s eclipsed by everything else and it’s easy to forget this is a 7.4% ABV beer. Definitely one to order by the crate, is this still the best bottled beer? I’m struggling to think of any better – 5 stars.